There are instances in which a person may wish to contest a will. This is a very difficult thing to do as the will is the last dying wish of the deceased. In order to successfully contest a will you would have to be able to claim and prove to the satisfaction of the authorities that the person making the will was of unsound mind when making the will or that the will had been made and pressure from another person or persons. In cases when all family members have been excluded from the will, as in the case when Branislav Costic of Russia gave all of his money to the U.K. Conservative Party, the sanity of the deceased at the time of writing the will may well be bought into question. The Inheritance Act of 1975 also states that adequate provision must be given to spouses and dependent children in a will. A will may therefore be contested on the grounds that mot enough money (or no money) is left to relevant family members. Other people may also reasonably contest the will as a cohabiting partner if they believe that they should have been entitled them to something (and especially as the law, providing that there is not a will, will exclude them from the inheritance). Significantly, for those who wish to write their own will, a will can become void if one of the beneficiaries has helped the benefactor to write it. This can thus lead to the will being contested and people not named on the will receiving money, or people named on receiving less money. Those named in the will, will nearly always receive something still under the terms of the revised handout. The first thing to do if you take exception at a will is to establish the grounds upon which you have a problem. Think carefully over these grounds and the case you would wish to maintain before registering your concern by ‘lodging a caveat’ at the Probate Registry. This halts any Grant of Probate, which is necessary as proof that the persons named in the will are entitles to share out the proceeds of the will as indicated in the will. It is necessary to a lodge a caveat as soon as possible if you wish to contest a will to ensure that Grant of Probate is not first issued. If it is, it may be too late to contest the will. The beneficiaries may an issue a document called a ‘warning’. This means that they do not feel that you have any entitlement to the will, and they are satisfied with the will, or at least do not agree with your objection. In this case you must decide whether to proceed with contesting the will or not. If so, you may wish to consider that a court case could be very costly – running in to tens, or even hundreds, of thousands of pounds. What is Capital Gains Tax: How is My Inheritance Affected? Do Estate Beneficiaries Have Jurisdiction Over Copyrights? Will Inheritance Affect My Council Tenancy? When Can I Challenge a Will? Are You Eligible for Widowed Parents Allowance? Questionnaire: Is a Trust Right For Me? What Are the Alternatives to Trusts? Which Type of Trust to Choose? Questionnaire: Do I Need an Estate Plan? How Much Will You Pay? Should I Hire an Independent Financial Adviser? What is Exempt from Inheritance Tax? When Should I Use the Power of Attorney? 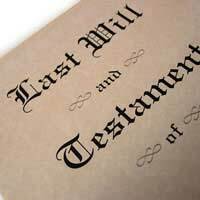 Who Will Pay Inheritance Tax?